Team takes their wild 347 Ford to Stage 3 with Hellion 76mm turbocharger, making massive power on race gas. (ANNOUNCER)>> TODAY IT'S STAGE ONE OF A POTENT STREET/STRIP 347 CUBIC INCH SMALL BLOCK FORD FULL OF POWER POTENTIAL. HIGH POWERED PROJECT. THE FORD WINDSOR SERIES OF ENGINES DEBUTED IN 1962 WITH THE CREATION OF THE 221 CUBIC INCH SMALL BLOCK VEIGHT. 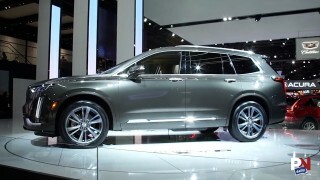 IT BECAME THE MOST POPULAR PERFORMANCE FOUNDATION FOR FORD. WE KNOW IT AS THE FIVEO. IN '86 IT ADOPTED ELECTRONIC INJECTION, LONG RUNNERS, AND A NEW HEAD TO CRANK OUT 200 HORSE AT 4,000 AND 285 POUND FEET OF TORQUE AT 3,000. (MIKE)>> TO KEEP ON THE PATH OF POWER AND INTERESTING PROJECTS WE'RE GONNA KEEP THE GEARS TURNING WITH THE NEW ONE WE'RE GONNA CALL LITTLE BLACK AND BLUE. AND IT'S TO RELATE TO ALL YOU DIY BLUE OVAL GEARHEADS. THE RECIPE GOES LIKE THIS, 347 CUBIC INCHES, A SET OF AFR 205cc RENEGADE CYLINDER HEADS, LUNATI VALVETRAIN, AND AN EDELBROCK VICTOR JUNIOR INTAKE MANIFOLD TOPPED OFF WITH A TRICKED OUT QUICK FUEL 750 CFM CARB. AND ALL THAT'S GONNA BE LIT OFF BY MSD IGNITION. 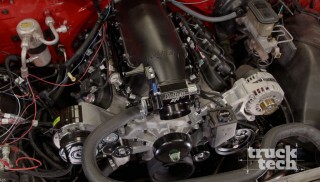 (PAT)>> SPECIFIC OUTPUT IN AN ENGINE IS EXPRESSED BY HORSEPOWER DIVIDED BY CUBIC INCHES. AND WITH OUR PARTS COMBINATION WE SHOULD ONE POINT THREEFIVE AND ONE POINT FOURFOUR HORSE PER CUBE, AND THAT'S DUE TO THE ABILITY OF 93 OCTANE PUMP GAS TO RESIST DETONATION. SO WITH A LITTLE QUICK MATH WE SHOULD MAKE BETWEEN 468 AND 500 HORSEPOWER. (MIKE)>> SAVING MONEY AT THE BEGINNING OF A PROJECT LEAVES YOU MORE FUNDS DOWN THE LINE FOR BETTER PARTS. THAT'S WHY WE PICKED UP THIS FULLY INSPECTED, MACHINED, AND FINISHED LATE MODEL 302 BLOCK FROM SUMMIT RACING. IT WAS INSPECTED FOR CRACKS AND FATIGUE BY BEING MAGNAFLUXED. THEN IT RECEIVED AN ALIGN HONE. THE DECKS WERE ALSO CLEANED UP AND IT WAS BORED, THEN FINISHED HONED USING TORQUE PLATES TO A FINAL FOURZEROTHIRTY BORE. PLUS ALL THE DOWELS, FREEZE PLUGS, AND OIL GALLERY PLUGS ARE ALREADY INSTALLED, MAKING THIS A CHEAPER ROUTE THAN TEARING YOURS DOWN AND TAKING IT TO THE MACHINE SHOP. THE MOST IMPORTANT THING FOR US IS THEY CLEARANCED THE BOTTOM OF THE CYLINDER SO OUR ROD BOLT CLEARS IT DUE TO THE LARGER STROKE ON THE CRANKSHAFT. NOW ALL THIS FOR ONLY $750 BUCKS. THE BLOCK IS SHIPPED WITH AN ANTIRUST COATING THAT HAS TO BE REMOVED BEFORE ASSEMBLY. NOW PAT IS GIVING IT A VISUAL INSPECTION TO MAKE SURE THERE'S NOTHING ELSE TO DO BEFORE ASSEMBLY. WHAT HE'S LOOKING FOR ARE BURRS, ROUGH EDGES, OR ANYTHING THAT JUMPS OUT AND CATCHES HIS EYE. (PAT)>> YOU KNOW I'VE BEEN MACHINING AND BUILDING ENGINES FOR OVER 25 YEARS AND I CAN TELL WHEN SOMEONE HAS GREAT ATTENTION TO DETAIL, AND THIS BLOCK REALLY SHOWS A LOT OF THAT. ALL THE FREEZE PLUGS WERE INSTALLED WITH THE LETTERING ALIGNED, THERE WAS NO OVERSPRAY, AND A LOT OF ATTENTION WAS GIVEN TO THE DEBURRING PROCESS. (MIKE)>> FILLING THAT BLOCK IS AN EAGLE SPECIALTY PRODUCTS 4340 FORGED ROTATING ASSEMBLY. NOW THE CRANK HAS A THREE-400 STROKE AND RECEIVED THEIR ESP ARMOR FINISH, WHICH IS NOT A COATING. IT'S A PROCESS THAT GIVES THE MATERIAL A MIRROR LIKE FINISH WITHOUT CHANGING ANY OF ITS TOLERANCES. NOW IT'S SO SLICK IT REDUCES FRICTION, WHICH REDUCES HEAT AND ALLOWS YOUR ENGINE TO MAKE MORE POWER BY REDUCING PARASITIC DRAG. OUR RODS ARE EAGLE'S FORGED HBEAMS THAT HAVE A FIVE-400 CENTER TO CENTER LENGTH AND THE CAP IS HELD IN PLACE WITH 8740 ARP ROD BOLTS. NOW OUR PISTONS ARE MAHLE'S FORGED 4032'S WITH A NEGATIVE SIX CC VALVE RELIEF. NOW THESE THINGS HAVE A ONE POINT FIVE, ONE POINT FIVE, THREE MILLIMETER RING PACK AND A ONEZERO-90 PIN LOCATION. NOW THE PROTECTIVE COATING ON THE SIDE OF THE SKIRT IS THERE TO PROTECT THE ENGINE DURING COLD START UPS. NOW ALL THAT WILL RIDE ON PROVEN CLEVITE BEARINGS. (PAT)>> OUR STARTING POINT FOR THIS BUILD IS TO CHECK MAIN BEARING CLEARANCE SO THE UPPER HALVES OF THE HSERIES MAIN BEARINGS WILL GO IN THE BLOCK. THE LOWER HALVES ARE PUT IN THE CAPS AND THEN PLACED IN THE REGISTERS. BEARING'S ID'S TO FIND OUR CLEARANCE. WE NEED BETWEEN 23 AND 28 TEN THOUSANDTHS TO FALL WITHIN OUR MINIMUM CLEARANCE REQUIREMENT OF ONE THOUSANDTHS PER INCH OF JOURNAL DIAMETER. THIS ONE FITS THE BILL. THE JOURNAL DIAMETER PLUS THE CLEARANCE, WHICH IS IN THE MIDDLE, EQUALS THE BEARING'S INNER DIAMETER, WHICH ALL OF OURS ARE IN THE GO ZONE. SO THE CRANK'S READY TO DROP IN. ROYAL PURPLE MAXX TOUGH WILL LUBE THE BEARINGS TO PREVENT DAMAGE DURING FIRE UP. NOW THE CRANK IS SLOWLY LOWERED INTO PLACE MAKING SURE IT MEETS THE BEARINGS EVENLY. THE MAIN CAPS CAN BE PUT IN PLACE AND SEEDED USING A RUBBER MALLET, AND REINSTALL THE MAIN GIRDLE FOR THE FINAL TIME. USING A DIAL INDICATOR, WE NEED TO CHECK OUR THRUST CLEARANCE. AND WITH SIX THOUSANDTHS THE BUILD CONTINUES RIGHT AFTER THIS. (ANNOUNCER)>> COMING UP WE FOCUS ON INDUCTION PRODUCTION. AND BLUE, IS READY FOR THE REST OF ITS ROTATING ASSEMBLY. NOW WE ALREADY CHECKED THE ROD BEARING CLEARANCE AND HUNG THE PISTONS TO THE RODS. SO THE NEXT ORDER OF BUSINESS IS TO DRESS THE PISTONS WITH THEIR NEW RINGS. THEY'RE MAHLE'S PERFORMANCE FILE FIT RING SET THAT HAVE A STANDARD TENSION. UP THE ROD BOLTS. READY? (MIKE)>> WITH ALL EIGHT INSTALLED WE CAN TORQUE THE ROD BOLTS TO 63 FOOT POUNDS. REMEMBER THE ROD BOLT CLEARANCE AT THE BOTTOM OF THE CYLINDER WE MENTIONED EARLIER? WELL HERE'S WHAT IT LOOKS LIKE. JUST AN FYI, THIS CLEARANCING WOULD COST YOU AN EXTRA $100 BUCKS AT THE MACHINE SHOP. (PAT)>> THE ROTATING VALVE ACTUATING MECHANISM, WHICH IS A FANCY TERM FOR CAM SHAFT, IS A VOODOO SERIES FROM LUNATI. NOW IT HAS SOME PRETTY HEALTHY SPECS WITH 241 DEGREES DURATION ON THE INTAKE, 249 ON THE EXHAUST ON 110 DEGREES OF LOBE SEPARATION. AND IT HAS 600 THOUSANDTHS LIFT ON BOTH INTAKE AND EXHAUST. THE RPM RANGE IS FROM 3,000 TO 7,000, AND IT NEEDS TO BE PAIRED UP WITH GOOD FLOWING CYLINDER HEADS TO MAXIMIZE ITS POTENTIAL. TO KEEP IT IN PLACE IS A MELLING THRUST PLATE TORQUED TO 120 INCH POUNDS. 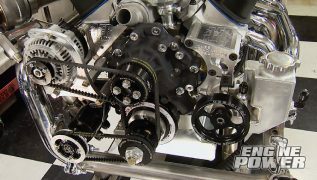 NOW THE LUNATI BILLET TIMING SET WITH MULTIPLE KEYWAYS CAN BE INSTALLED STRAIGHT UP. THEN TORQUE THE CAM BOLT TO 40 FOOT POUNDS. NOW OUR FEL PRO TIMING GASKET CAN GO ON, FOLLOWED BY THE SUMMIT RACING TIMING COVER AND ATI TIMING POINTER, WHICH IS ALL HELD IN PLACE WITH ARP FASTENERS. CONTROLLING ENGINE VIBRATIONS IS AN ATI SFI APPROVED SUPER DAMPER, HELD IN PLACE WITH AN ARP CRANK BOLT AND TORQUED TO 100 FOOT POUNDS. OF THE VALVE STEM. AND TIGHTEN THE ROCKER NUT SO IT JUST TOUCHES THE FULCRUM. OF THE ROCKER ARM LEAVES A MARK ON THE VALVE TIP, WHICH IS THE AMOUNT OF SWEEP THE ROLLER MOVES ON IT. WE'RE LOOKING FOR A NARROW MARK ON THE CENTER OF THE STEM, WHICH INDICATES THE VALVETRAIN GEOMETRY IS CORRECT FOR THIS APPLICATION. ALL OF THIS IS DICTATED BY THE PUSH ROD LENGTH, WHICH IS SIX-600. AFTER YOU DETERMINE YOUR LENGTH, A QUICK CALL TO SUMMIT RACING WILL HAVE NEW PUSH RODS ON YOUR DOOR STEP IN NO TIME AT ALL. WE'LL BE RIGHT BACK. (MIKE)>> WITH LUCK ON OUR SIDE WE'RE ABLE TO CONTINUE ASSEMBLING LITTLE BLACK AND BLUE. THAT'S BECAUSE WE FOUND A SET OF FIVESIXTEENTHS PUSH RODS THAT JUST SO HAPPEN TO BE THE PERFECT LENGTH IN OUR EQUIPMENT CAGE. NOW BEFORE THESE GO IN, WE NEED TO PREP OUR HEAD BOLTS. (PAT)>> BY APPLYING ULTRA TORQUE BETWEEN THE SHOULDER AND THE WASHER, PLUS THREAD SEALANT ON THE THREADS SINCE THE LOWER ONES GO INTO THE WATER JACKETS OF THE BLOCK. IT'S A GOOD PRACTICE TO COAT THEM ALL THOUGH SO THE SAME TORQUE VALUE IS ACHIEVED ACROSS THE HEAD. WE'LL TORQUE THEM TO 65 FOOT POUNDS. ON PERFORMANCE BUILDS, PUSH ROD LENGTH IS NEVER SET IN STONE LIKE OEM APPLICATIONS. 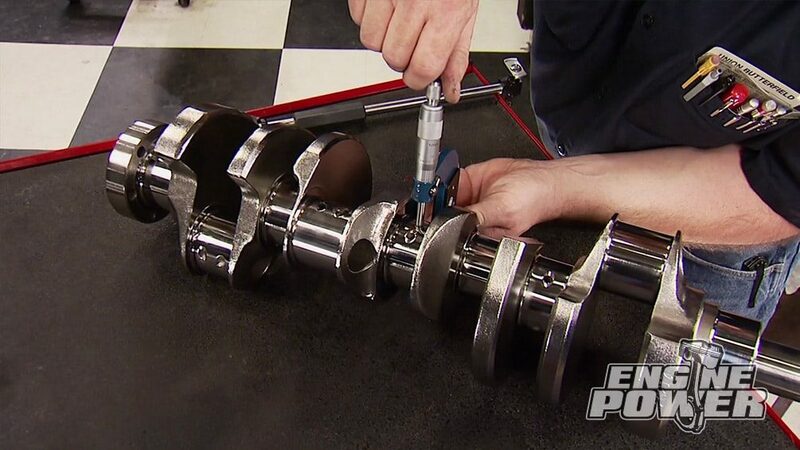 TYPES, AND ROCKER ARM RATIOS ARE ALL FACTORS IN DETERMINING THE CORRECT LENGTH. NOW THE TWO PIECE GUIDE PLATES AND ROCKER STUDS CAN GO ON. AND USE THE ROCKER ARMS AS AN ALIGNMENT TOOL TO GET THE GUIDE PLATE IN THE RIGHT POSITION. NOW TORQUE THE ROCKER STUDS TO 50 FOOT POUNDS. USING A TIG WELDER, TACK THEM TOGETHER IN THREE PLACES. USING A MIG HERE WILL GET TOO MUCH SPLATTER ON THE ENGINE. NOW DROP IN THE PUSH RODS AND APPLY EXTREME PRESSURE LUBE ON THE CONTACT AREA BETWEEN THE PUSH RODS AND THE ROCKER ARM CUPS TO PROTECT THEM DURING INITIAL FIRE UP. WITH THE NUMBER ONE CYLINDER AT TDC, WE'LL SET ITS VALVES UP AT A QUARTER TURN PAST ZERO LASH. READY TO SEAL THE VALLEY USING FEL PRO GASKETS AND SILICONE ON THE CHINA RAILS. SECURING THE INTAKE ARE ARP STUDS, WHICH ALSO HELP ALIGN IT DURING INSTALLATION. IT'S A VICTOR JUNIOR SINGLE PLANE INTAKE MANIFOLD. IT HAS AN OPERATING RANGE FROM 3,500 TO 8,000 RPM, AND ACCEPTS 4150 SQUARE BORE CARBURETORS. NOW WE CAN TORQUE IT TO 26 FOOT POUNDS IN A CROSS FASHION. THEN REPEAT THIS PROCESS A FEW TIMES SINCE YOU WILL GET GASKET COMPRESSION. IT'S LIGHTS OUT FOR THE VALVETRAIN WITH THESE SUMMIT RACING CAST ALUMINUM VALVE COVERS. THEY LET YOU KNOW LITTLE BLACK AND BLUE'S CUBIC INCHES AND THAT IT'S A STROKER. WE'RE USING AN ELECTRIC WATER PUMP TO AVOID PARASITIC DRAG. WE WANT TO PULL EVERY BIT OF POWER OUT OF THIS ENGINE ON THE DYNO. THE HOLE IN THE GEAR IS 90 DEGREES FROM THE ORIGINAL HOLE IN THE SHAFT. SHAFT AND INSTALL THE SUPPLIED ROLL PIN. WITH LUBE ON THE GEAR AND THE ORING IN PLACE IT'S READY TO DROP IN. (MIKE)>> NORMALLY RED, WE ADDED OUR OWN DUPLICOLOR TOUCH IN FORD BLUE. WRAPPING UP THE FRONT IS THIS THERMOSTAT HOUSING WE GOT FROM SUMMIT. NOW THE VALVE COVERS ARE TOPPED OFF WITH TRICK LITTLE BREATHERS FROM SPECTRE. AND TO GET READY FOR THE CARBURETOR, A GASKET, A UCM ONE INCH CNC CARB SPACER, ANOTHER GASKET, OUR DYNO THROTTLE PLATE, ANOTHER GASKET, THEN FINALLY THIS QUICK FUEL BLACK DIAMOND QSERIES 750 IS GOING TO FEED THIS LITTLE BEAST. AND DOWN LEG BOOSTER. NOW IT'S DESIGNED FOR DRAG RACE USE AND SPORTS THE SATIN BLACK FINISH. A SPECTRE EXTRA FLOW 14 INCH AIR CLEANER ASSEMBLY WILL TOP IT ALL OFF. THIS ENGINE IS A SMALL PACKAGE THAT'S GONNA PACK A BIG PUNCH. 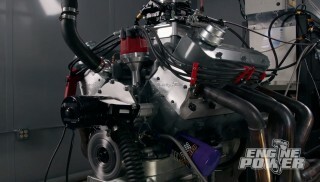 (ANNOUNCER)>> THE DYNO'S NEXT, WILL OUR CALCULATIONS COME TRUE? STAY WITH US! (MIKE)>> LITTLE BLACK AND BLUE IS HOOKED UP AND READY TO RUN. SO HOW MUCH GRUNT IS IT GONNA PUT OUT? WELL WITH 347 CUBIC INCHES, A 10.4 TO ONE COMPRESSION RATIO, THE 205cc CYLINDER HEADS, AND THE VICTOR JUNIOR INTAKE MANIFOLD ALL LIT OFF BY 93 OCTANE, WE'RE GONNA SAY 450. (PAT)>> THAT IS A REALLY NICE ENGINE. (MIKE)>> HOW COOL IS THAT! (PAT)>> I THINK WE UNDERESTIMATED IT SLIGHTLY. (MIKE)>> 457 ON POWER, TORQUE WAS 430. JETTING EFFECTS HORSEPOWER, AND THEY EACH EFFECT EACH OTHER. (MIKE)>> 466 ON POWER, 439 ON TORQUE, OUT OF A 347 BABY. SO WE'LL ADD TWO MORE FOR 34 DEGREES AND RAISE THE ENTIRE SWEEP, STARTING AT 3,500 AND PULLING OUT AT 6,500 RPM. MAN THIS THING IS SWEET! 494, 440! (MIKE)>> WE'RE ONLY ADDING ONE DEGREE FOR THIS RUN. (MIKE)>> TO GIVE IT A BETTER CHANCE WE'RE GOING TO RUN THE ENGINE FROM 4,000 TO 6,800 RPM. (PAT)>> I THINK I SAW, I THINK I SAW IT. (MIKE)>> I THINK I FELT IT. 504, 446, YES! (MIKE)>> 507, 447, LET'S SEE WHAT IT DID FOR HORSEPOWER PER CUBE, 146! AND ON THE TORQUE SIDE ONETWONINE. (PAT)>> THAT IS EXCELLENT FOR PUMP GAS. (MIKE)>> AND IT EVEN EXCEEDS PAT'S PREBUILD CALCULATIONS. THAT'S IT BABY. (PAT)>> PHASE ONE IS COMPLETE! (MIKE)>> PHASE ONE IS DONE, THAT IS AWESOME PAT, THAT IS AWESOME! (PAT)>> THAT IS AN AWESOME ENGINE. I LIKE IT, NICE JOB! (MIKE)>> THE PARTS LIST WILL BE ON THE WEBSITE. (PAT)>> ONCE AGAIN SCIENCE AND PHYSICS DON'T LIE. THESE PARTS WERE MATCHED UP BASED ON THEIR CAPABILITIES AND OPERATING RANGE. THERE ARE NO SECRETS HERE. THEY'RE OFF THE SHELF PARTS WITH A SOLID BUILD AND GOOD ATTENTION TO DETAIL. 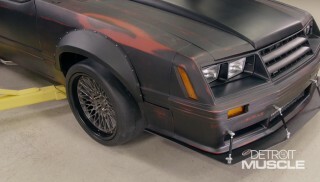 AND WHO KNOWS, AT SOME POINT THIS MAY BE OFFERED AS A CRATE ENGINE PACKAGE FROM SUMMIT RACING. NEXT TIME WE'RE GOING BIGGER ON INDUCTION, VALVETRAIN, AND COMPRESSION, AND YOU DON'T WANT TO MISS THAT.